Experiencing tongue burning after eating is a very common affliction that plagues many people of all ages, especially after biting the tongue or consuming certain foods. The unfortunate incident is only worsened in the case of some menopausal women suffering from the more serious condition known as burning tongue syndrome. Luckily, tongue burning is at least partially preventable. Read on to discover some of the most common foods that should be avoided. Consuming extremely hot foods and beverages, even if only occasionally, is a surefire way to cause tongue burning when eating. Foods such as soups, casseroles, roasted dishes, and fried appetizers are of particular danger to many sufferers. Whatever the case may be, it is important to afford yourself adequate time and patience for meals. Indeed, consuming hot foods without testing their temperatures first - or underestimating the temperature of their steam - only serves to worsen the already uncomfortable effects of burning tongue syndrome, creating a scalding, tingling, or numb sensation in the mouth. Certain flavoring agents, like cayenne and a few other peppery seasonings, contain the spicy ingredient capsaicin. The effect of capsaicin is that it triggers the delivery of pain signals to the brain, which causes it to think that the body is being burned. Thus, one of the best ways to avoid mouth burns when eating is to simply cut out popular spicy foods, such as Indian curries, Jalapeño poppers, hot salsas, and other condiments. Also, because hormone fluctuations during menopause are responsible for a decline in taste bud sensitivity, many women have reported uncomfortable palate numbness and various other abnormal changes in feeling on the tongue. This often results in the rampant over-seasoning of both home-cooked meals and store-bought preparations. Stimulating a natural, warming sensation in the mouth, alcohol consumption has been known to exacerbate the symptoms of burning tongue syndrome. In fact, for many people, the familiar burn of drinks like vodka, tequila, and gin is a distinctive and welcomed characteristic. Meanwhile, part of the allure of fruity blended cocktails is that they are cool, sweet, and generally pleasant for the taste buds. However, the frozen beverages often contain oranges, lemons, limes, or some other citrus ingredients that can intensify the feeling of tongue burning. Frequent suffers should also be careful to avoid strong mouthwashes and other alcohol-based home dental treatments. In addition to these three, many have found relief through the use of pain-relieving, anti-inflammatory drugs. Still others swear by more natural methods of action, such as drinking cool, bland beverages, and consuming white bread. 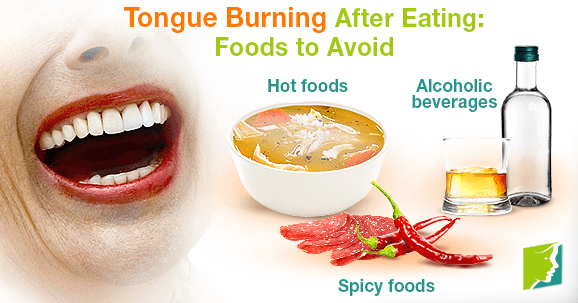 Read on to learn more about natural remedies and other treatment options for burning tongue after eating.